Chicken Cheese Balls are a great and easy snack, that’s perfect for school lunches or an after school lunch. Make a batch of these Chicken Cheese Balls and freeze them for a month, and you’re good to go! What Are Chicken Cheese Balls? 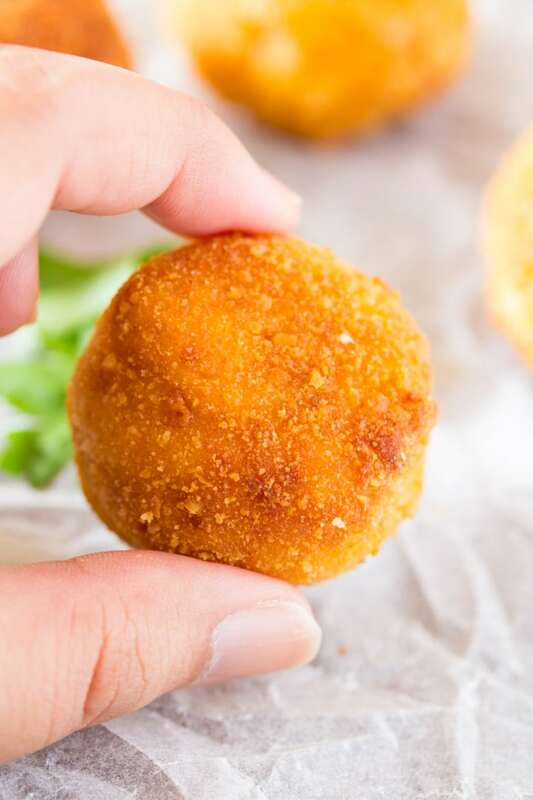 Chicken Cheese Balls are a delicious and crispy snack, and I think the name says it all. But seriously, how can you go wrong with chicken, cheese and a crispy coating? Not wrong at all, I think. 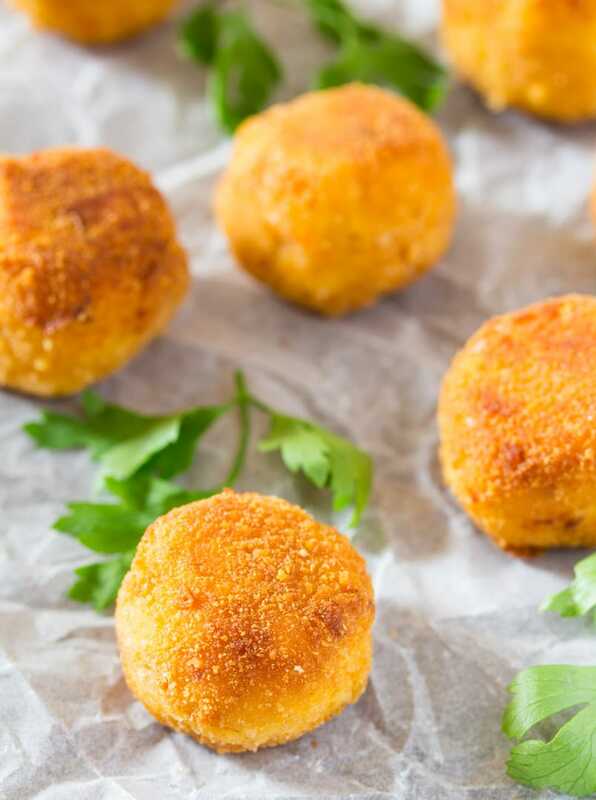 And these chicken cheese balls are everything that your snack loving heart craves for: there’s chicken, cheese and a crispy coating for breadcrumbs. And guess what? these Chicken Cheese Balls are baked, not fried. So there’s no hassle of frying (I can go to any length to avoid frying), and it also means that these Chicken Cheese Balls are kinda healthy. 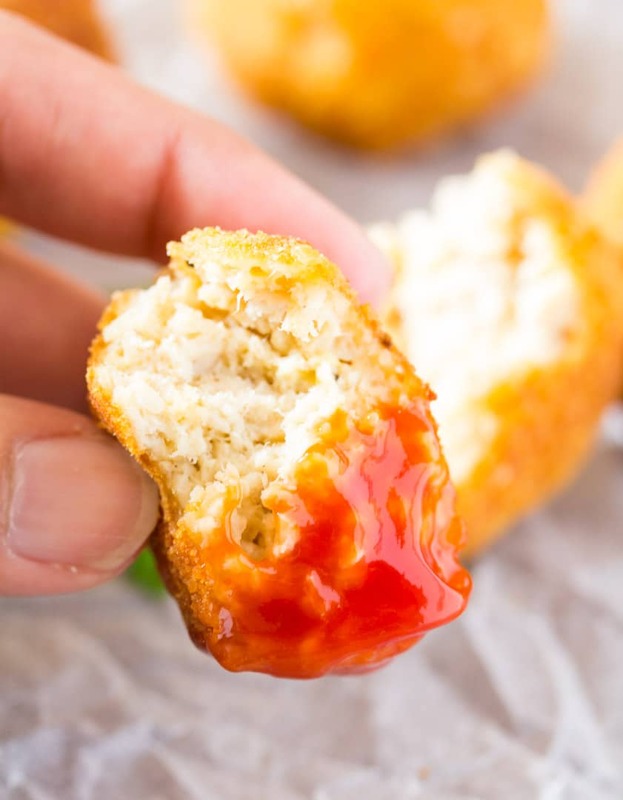 These chicken cheese balls are super kid friendly (and adults too!) and are perfect for school lunches or mid afternoon snacks. These would be a great appetizer for super bowl parties and birthday parties too! These cheesy balls are pretty straightforward to make, but the only thing I’d like to stress upon is that when baking these Chicken Cheese Balls, make sure that you grease the foil generously with oil. And also turn around the balls on the baking tray, so that all the the sides are coated with oil. This will ensure that the chicken balls bake crispy, and not soggy. I love dipping these crispy baked golden beauties in ketchup (I know how sophisticated :p) but these would be great dipped in ranch sauce or even BBQ sauce! How Do You Make Chicken Cheese Balls? Start by cooking the chicken and then shredding it. You can either use a fork to shred the chicken or even a food processor. I used a food processor. Then add cheese, mayo, sweet chilli sauce and an egg. And mix thoroughly and shape into balls, about a tablespoon each. And then coat the chicken cheese balls with breadcrumbs. You can now either bake or fry them. I like baking them. For the detailed recipe ingredients and instructions, scroll below to the recipe card. 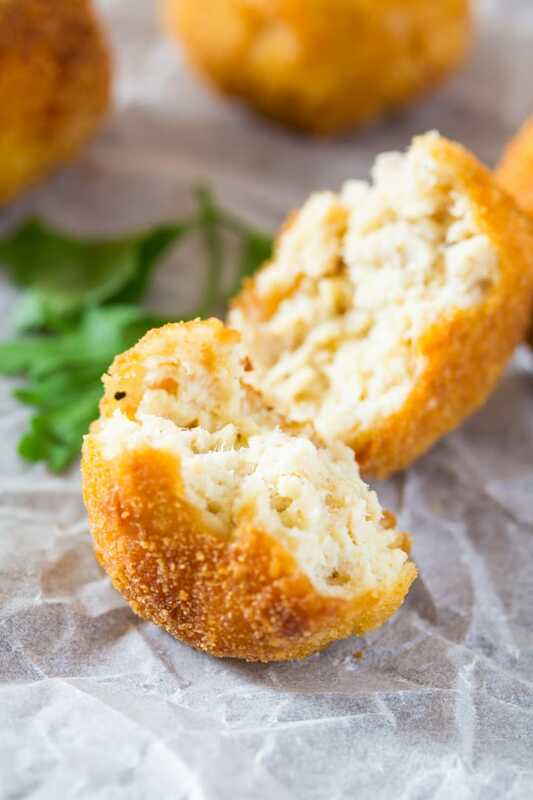 These chicken cheese balls can be either baked (as shown in the pictures) or they can be deep fried as well. Can You Freeze these Chicken Cheese Balls? Yes! You can certainly freeze these chicken cheese balls. Start by preparing them, and once they’re coated with the breadcrumbs place them on a tray or plate, and partially freeze them. Then place them into ziplock bags and freeze up to a month. 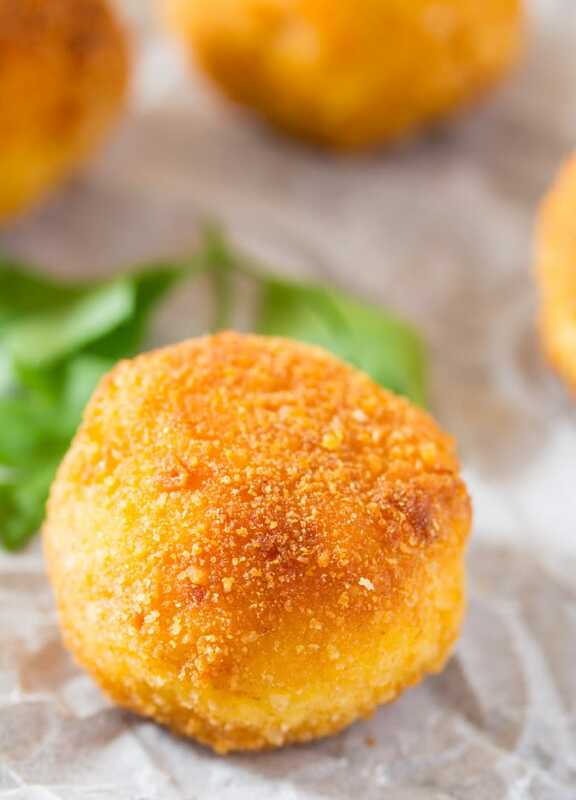 I do hope you try this simple and delicious recipe, and I’m sure you’ll never want to buy the chicken cheese balls from the frozen aisle again because these Chicken Cheese Balls are da bomb! These Chicken Cheese Balls are the perfect baked appetizer for parties, or even great as snacks for school lunches. Can be made ahead and frozen. In a medium sized pot, add 1/2 cup water, the chicken breasts, garlic paste, jalapeno, salt and pepper. Cover the pot, and boil the chicken until it's cooked through. Once the chicken is cooked through, remove it from the pot and let it cool. Shred the chicken with a fork, or you can use a food processor (I used a food processor). Make sure the chicken is cooled down if using food processor to shred it. Transfer the shredded chicken to a bowl, and add the cheese, mayonnaise, sweet chilli sauce and one egg. Mix until all the ingredients are combined. Roll this chicken mixture into balls (about 1 tablespoon each). Now for the breading of these chicken cheese balls: place the remaining egg, bread crumbs and flour in separate shallow dishes. Add one tablespoon of water to the egg and whisk lightly. Now start by rolling one chicken cheese ball in the flour, then dip it in the egg and then roll it in the breadcrumbs until fully coated. Continue these steps, until all chicken cheese balls have been breaded. Place the chicken cheese balls on the baking tray, and bake 15-20 minutes or until the chicken cheese balls are golden brown and crispy. Note: These chicken cheese balls can be made ahead and frozen up to 1 month. Just complete all the steps until the chicken cheese balls have been breaded. Then partially freeze on a freezer safe tray, and then transfer to a zip lock bag. 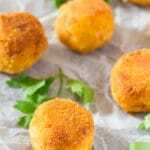 For baking frozen chicken cheese balls: bake as instructed above but the baking time may be a few minutes longer if using frozen chicken cheese balls. Now this is my kind of food -such beauties golden crispy outside and melt-in-mouth inside. I can eat these all day long and then wish the day was 28 hrs long! I love it I love I love it. But there is no way I am going to have them with Tom Ketchup. I will make my own Tom Chutney with my favourite 6 ‘Reds’ Red Tomatoes, Red Chillies, Root ginger, Root Turmeric, Red Onions, Rapeseed oil.